Sure, everybody Googles, and Google Earth is de rigueur. But my question is, "Have you seen SketchUp?" This tool for three-dimensional modeling is fun, engaging, and, in the end, powerful. What I am enjoying the most about introducing SketchUp to kids and teachers I work with is the level of spontaneous creativity it engenders. Lots of kids, and more than a few adults, start doing cool things that require perseverance and complex thinking, and they are doing these things without being asked to. Need some help getting started? Free tutorials are available online, and the learning around this tool happens quite quickly. In Sarah Plain and Tall, Sarah has gone to the prairie and is living in a house with Caleb, Anna, and their father, Jacob. Use the text to look for clues that tell you what this house looks like, and create a model of it in SketchUp. The turtles that are living in the pond in front of our school need a place to climb up out of the water to get some sun. Use SketchUp to design a sun porch for the pond. Create a series of geometric solids in SketchUp, and be prepared to explain how your understanding of these shapes enabled you to do this. Create a series of three-dimensional solids in SketchUp that will tessellate. Design three separate and distinct seating and deck plans that would make the open space between the wings of our school useful to a variety of groups, including classes, musical ensembles, presenters, and informal gatherings. We are going to build a shed for our garden. Use SketchUp to create a design you think we should build, and be prepared to advocate for your design in front of our team. We will be selecting one of the designs to build, so make yours as good as it can be. We have studied the architecture of our community. 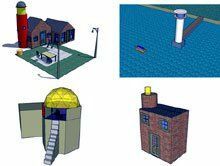 Select a building you especially enjoyed learning about, and create an accurate model of it in SketchUp. How could the packaging of milk be changed to make it more appealing to children ages 10-15? Use SketchUp to create a model of your new packaging. Use SketchUp to explore and extend your understanding of perspective. Be prepared to present to the class, including explaining what you have seen and built and describing how it has enhanced your understanding of perspective. Use SketchUp to create an atomic model of the sugar molecule you are investigating. And what about an assignment for the teacher? Hey, time to get on with this. You have been talking about building that little cabin in the woods or by the lake or next to the ocean or on the mountain or in the valley for years. So, what if you were to actually get around to it? What might it look like? Use SketchUp to make your ideas visible -- to yourself and to others around you. Like any good technology integration, make sure your use of SketchUp is not about the technology. You teach mathematics, English, science, world language, social studies, art, music, or some other curriculum area, so blend the use of this tool into your work -- set its quality and power to work for you and your students. The kids will find the cool stuff and the open challenges in the weekly 3D Challenge, and they will discover that they can place their models into Google Earth. Teachers should head to the Education section, where they will find lots of ideas, a forum for discussion, and examples of student work from around the world. Oh, and did I mention that professional architects use this tool? How about inviting professionals to school to either help you get started or, better yet, see the great things you and the kids are doing! Let me know what you think about SketchUp and what you do with it, and, above all else, have fun!